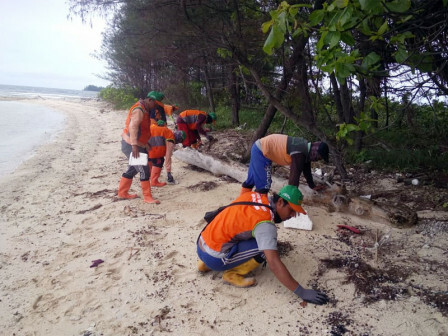 Thousand Islands Environment Sub-department's coastal officers clean up crystallized waste oil on the coastal area of Jukung Island, Harapan Island Urban Village, North Thousand Islands.
" We deploy 10 personnel to clean crystallized waste oil along Jukung Island's coastal area"
Thousand Islands Environment Sub-department Head, Yusen Hardiman informed, his side follows up resident's report by cleaning the waste from Sunday (2/9) to Monday (2/11). "We deploy 10 personnel to clean crystallized waste oil along Jukung Island's coastal area. Today, all the waste have been collected and now the coastal area becomes clean," he said, Monday (2/11). "We are still don't know where the waste oil came from," he conv eyed.